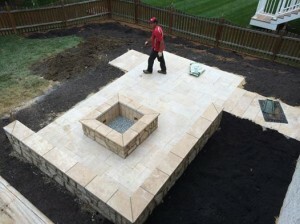 As many of you know, KW Landscaping loves to work with Travertine and also loves to help their customer’s achieve their dream outdoor living spaces. This is why we want to show you the big picture. From a dream to reality, here is a real Maryland Home Landscaping travertine project that walks us through the process, day by day. Email KW Landscaping with questions regarding your dream outdoor landscape. 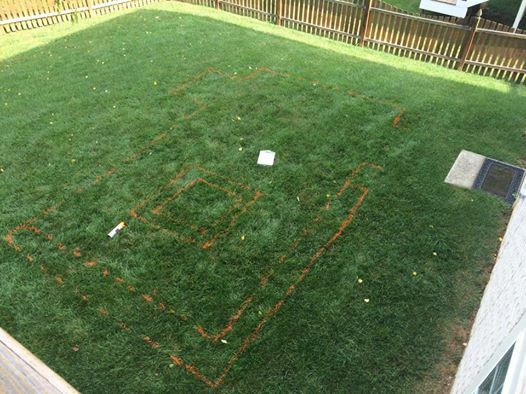 Here you will see the landscaping plan that the client approved prior to any work being done on their property. 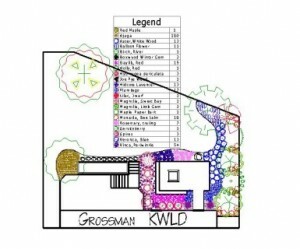 Once the client has approved the design then we can get to work. 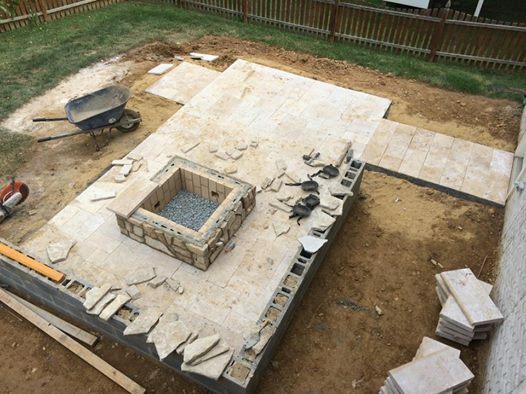 Day One: Draw out the design for the Travertine Patio with sitting wall and fire pit. Day 2: Pour the concrete footing for the sitting wall and fire pit. 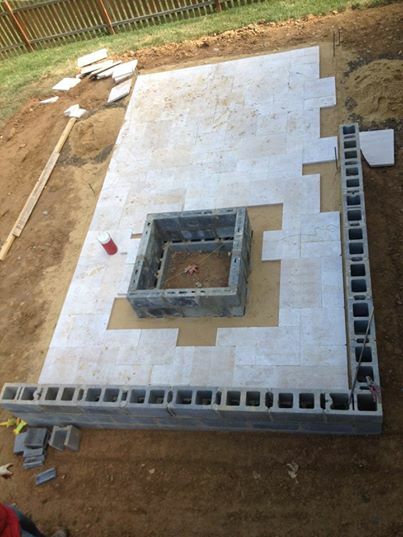 Day Three: Laying the foundation for the Travertine is all about layers to ensure quality. Block work to support the sitting wall and firepit. 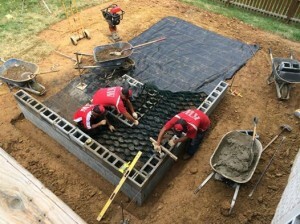 Filter cloth, stabilizing grid (this is a plastic honeycomb grid for extra stability), recycled concrete to fill the grid and create a firm surface. 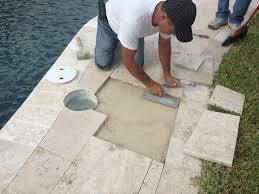 Then, a thin layer of sand to set the travertine in. Day Four: The true beauty starts to show. The travertine is laid down and the natural stone veneer will be placed on the fire pit and sitting wall. 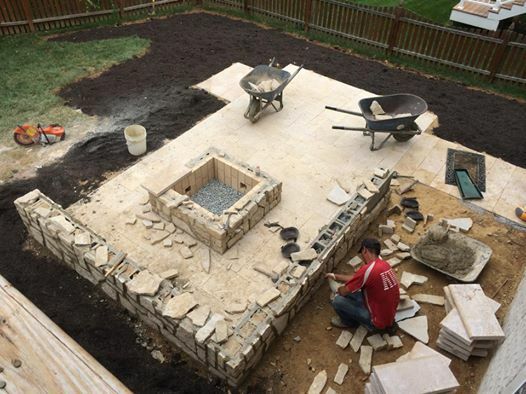 The inside of the fire pit will be finished with a special fired brick and heat proof mortar to withstand the heat from the fire. Day Five: Natural stone veneer is being installed over the cinder block then a bullnose travertine cap to finish the fire pit and sitting wall. Compost and Espoma bio tone will be tilled into the beds today giving the plants a cozy place to root. Plants were also delivered this day. Day six: The Compost is in the beds and the planting starts today. This project is almost complete. 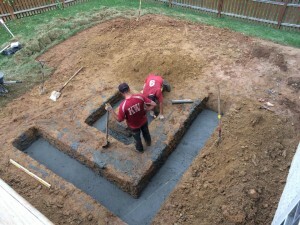 Day Seven: Everything is almost done. Now we plant, mulch, sod and clean up.